Sponsor: Buffalo Bill Days, Inc.
Three of Golden's signature tourist events happen in July and August. 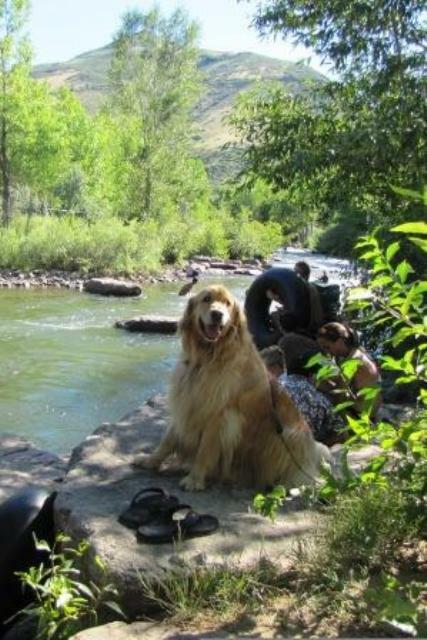 The 'paws' that refreshes: Every hot day in August and July, hundreds cool off in Clear Creek. Dangle your feet; float in an inner tube, or dog paddle, but watch out for those kayaks. Best of all, it's free. 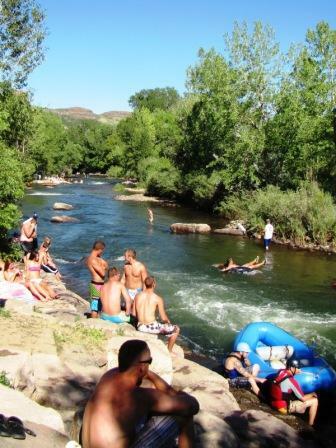 Clear Creek is the place to be on a hot August day. First up is the annual Fourth of July celebration, sponsored by the Golden Lions Club. This all-day event at Lions Park in Golden culminates in a fireworks display at dark (around 9 pm) provided by the municipal government. There is live music, activities for children, over 200 raffle prizes, food vendors and more. Expect to see lots of blankets and picnic baskets spread on the grass of Lions Park and on the rocks and banks of Clear Creek just across the street. Buffalo Bill Days kicks off on on the last Thursday of July and continues through the weekend. The Golden Fine Arts Festival is in late August.